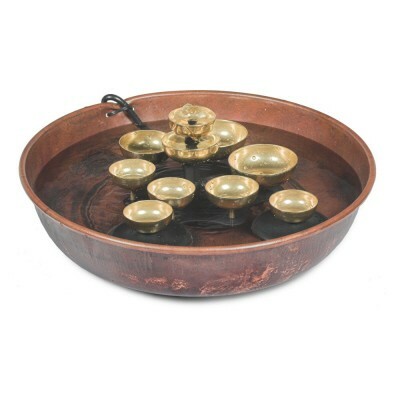 Featuring a beautiful, flame-finished copper bowl & soothing chiming bells, the swirling motion of floating bells provides this fountain's peaceful chiming sounds. Create an oasis in your garden - the soothing murmur of the water combines with the gentle ringing of the bells to create a tranquil mood. Includes set-up instructions and care instructions. This lovely water bell fountain measures 6 in. tall by 16 in. in diameter. Bowl is copper and 10 bells are made of brass, includes a continuous-duty pump.